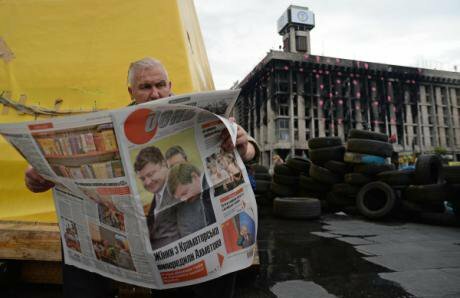 A protester reads a newspaper in the tent camp on the Maidan in Kyiv, 2014. (c) Maxim Blinov / RIA Novosti. 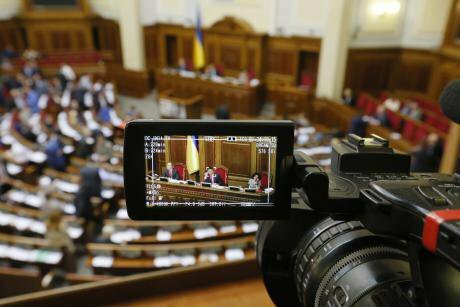 All rights reserved.The start of 2017 saw Ukraine shaken by another “tape scandal”. Alexander Onishchenko, a Ukrainian MP who recently fled the country (and is accused of embezzling funds from a state-owned gas producer), has accused president Petro Poroshenko of allegedly creating a huge system of political corruption. From the safety of the UK and now Germany, Onishchenko has claimed that, at the direction of Ukraine’s president, he personally bribed parliamentary colleagues and members of the Central Election Commission, organised a smear campaign against former premier Arseniy Yatsenyuk and much else besides. Onishchenko is yet to provide convincing evidence of these claims — the supposed audio recordings of secret negotiations involving president Poroshenko. That said, there is enough information in Onishchenko’s allegations which correspond to real events that we should at least consider them a potential version of the truth. On the whole, this story — in which a fugitive corrupt official accuses the head of state of even further corruption — is, despite its absurdity, all too Ukrainian. And the fact that, instead of clear repudiations, the Presidential Administration is blaming the “hand of the Kremlin” and, via lawyers, threatening legal consequences for western media that publish interviews with Onishchenko, illustrates all too well the attitude of the current Ukrainian authorities to criticism and freedom of expression. One of Onishchenko’s first statements was made at the end of September 2016, in which the people’s deputy stated that he had been involved in negotiations in summer 2015 over the sale of a popular Ukrainian TV channel, 112, on behalf of Poroshenko. Allegedly, Ukraine’s head of state thus planned to change the editorial stance of 112, a 24/7 news channel which has frequently criticised the government. To put it simply: Poroshenko’s team were allegedly going to “give them  money to shut up”. This happens in Ukraine, albeit not often. The last time was in summer 2013, when Sergei Kurchenko, a young businessman close to ex-president Viktor Yanukovych, bought Ukraine’s only large non-oligarch-owned media project, Ukraine Media Holding. This company owned numerous media, including the Ukrainian Forbes, which was actively investigating Kurchenko’s activities at the time. “The zone of freedom of expression is narrowing,” said Mikhail Kotov, editor-in-chief of Ukrainian Forbes, after journalists, unhappy with the first signs of censorship, began to leave outlets owned by UMH Group in late 2013. Several months later, journalists went out onto the Maidan to protest against the winding up of democracy with precisely this slogan in mind. It was at that time, the first days of EuroMaidan, that the 112 TV channel started broadcasting in Ukraine. This timing, together with the channel’s complicated ownership structure, profitable licensing and inspiring investments, gave grounds to connect the new channel with the “Family”, the elite grouping around ex-president Viktor Yanukovych. At this point, the Family, which had grown rich on corruption schemes, had been actively investing in the media business for several years. It seems that the Family, concerned with their influence at the upcoming elections, were trying to encourage competition against existing media that belonged to the “old oligarchs”. Channel 112 was the last such media project. Among Ukraine’s media community, people connected the new channel to Vitaly Zakharchenko, minister of interior affairs at the time. Capital, a business daily launched in 2013 was linked to Sergei Arbuzov, former head of Ukraine’s National Bank; and the emergent Vesti media holding was thought to be in the hands of Alexander Klimenko, Ukraine’s then-minister of revenue. It goes without saying that, with the start of the protests, the Family’s media were supposed to support the authorities — this was the task their owners gave them, based on the same tactic of “give them money to shut up”. 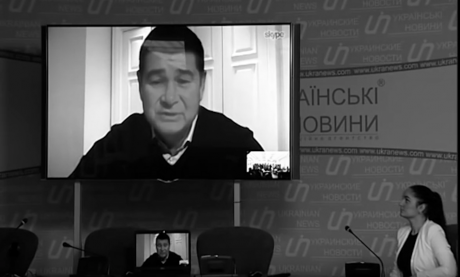 Aleksandr Onishchenko gives a press conference via Skype on corruption in Ukraine. Kyiv, December 2016. Video still: Ukrayinski Novyny / YouTube. Some rights reserved.At the time, I worked for one of the Family’s media, the magazine Vesti.Reporter, which belonged to the holding of the same name. It seems funny to recall this now, but, every week, my colleagues and I would anxiously read through the latest issue of the magazine looking for signs of censorship. Yet, throughout those three months of protest, Euromaidan remained for the magazine, and for many other “Family” media, our number one topic. Indeed, perhaps it was precisely these concerns over censorship that helped us maintain the balance between our personal sympathies and the need for a professional, critical view of what was happening. At least, that’s how it seemed to us. From the side of the protests, though, Family media began to be targeted more and more with accusations of propaganda. Opposition journalists, who were fighting for freedom of the press and democracy, quickly learned not to notice the revolution’s shortcomings: the lack of organisation, the unjustifiable violence, the backroom deals and absence of a positive programme. This mutual distrust soon spread through Ukraine’s media community, splitting it into “insiders” and “outsiders”. And when, a few days before the bloody clashes of 18 February, I shared my plans to investigate the paramilitary group Right Sector with one respected editor-in-chief, he told me: “It’s a good story, but if I read it in your magazine, I won’t believe it.” A few days later, my colleague Vyacheslav Veremiy was murdered, and this news failed to provoke even compassion from some colleagues — instead, people reminded him on Facebook of an article he’d written six weeks earlier about how prostitutes had been working on the Maidan. After the revolution, the Family fled the country together with Viktor Yanukovych. Several of their media projects, including 112 and Vesti, continued to operate, receiving financing by other means. This gave them the opportunity to cover what happened after Maidan — annexation of Crimea, protests in the Donbas, the start of the Anti-Terrorist Operation — in depth. Our outlet’s owners may have wished otherwise, but we couldn’t close our eyes to Russian aggression at that time. But at the same time, we couldn’t ignore the failings of the new authorities who had taken responsibility for the country at such a difficult moment. However, the idea that “criticism was unwelcome” in revolutionary conditions soon developed. For many of my journalist colleagues, it was around this time that a powerful idea crystallised: to criticise the authorities or army was a path to treachery. Any critical remarks towards the government or army leadership was compared to the work of Russian propaganda. News of mistakes on the frontline, calls for peaceful negotiations, indignation at the corruption which went nowhere came to be perceived as mere elements in the information war. All of this gave those who wanted to destroy the “Family media” a free hand. At first, patriotic civic organisations called for their boycott, then picketed “hostile” outlets and even attacked people distributing their newspapers. At the same time, the authorities searched for legal measures of influence. As the authorities investigated potential schemes of shadow financing, regular searches began to be carried out in the newsrooms of media projects “connected to the Family”. For quoting separatists in a reportage piece, a criminal case was opened against Vesti.Reporter, the magazine I worked for, on the basis this was equal to calling for the overthrow of Ukraine’s constitutional order. Other outlets did this too, but only our texts received the forensic linguistic treatment. The criminal case is still open, and today, a year since Vesti.Reporter closed, the magazine is being used to put pressure on Strana.ua, an online news portal created by former Vesti employees. In the Yanukovych era, this kind of pressure on media would have provoked severe indignation in the professional community. But today, the drawn-out armed conflict and open foreign aggression allows the Ukrainian authorities to justify limits on press freedom on patriotic grounds. In this situation, it’s unlikely that president Poroshenko would have to purchase Channel 112 or hire Alexander Onishchenko to do so — you don’t even need money to shut opposition media up anymore. On 28 November 2016, on the third anniversary of TV channel 112’s launch, its audience reached 4.4m people. This is a high, albeit situative, figure for a news channel in Ukraine — it’s several times bigger than Channel 5, which belongs to president Poroshenko. But 112’s ratings are nothing compared to Ukraine’s big channels, which are owned by the country’s four main oligarchs — Rinat Akhmetov, Dmitry Firtash, Igor Kolomoisky and Viktor Pinchuk. According to Nielsen’s TV ratings, in November, the oligarchs’ channels occupied the first ten lines of the most popular programmes, with a total share of more than 67% of the population above the age of four. The “Big Four” have formed their media empires over the past two decades, receiving an unprecedented monopoly on access to audiences. People can pick up these channels easily. Cable operators in big cities are obliged to include them in their TV packages. And all of this is more or less free. In Ukraine, the television business is very costly and pathologically unprofitable. However, the oligarchs are yet to grow tired of investing their money in it. They have other sources of income and can run their media holdings at a financial loss, but a political gain, thereby maintaining a powerful tool of political influence. Competing with one another for millions of viewers, oligarch media attract viewers in the first place with their entertainment content — new shows and serials, live sports and concerts. Ukraine’s journalism, too, has gradually transformed into a well-directed show. When you watch the news, first you get the patriotic reportage from the frontline, then you get a careful measure of chernukha (a social or criminal segment that is shocking in its detail or depravity), then comes the investigative piece that chimes with the business interests of the channel’s owner. The pluralism of expert opinions that emerges in the Sunday night talk show, as a rule, also follows the tactic of diversifying political investments. The fight against the oligarchs, calls for which sounded during EuroMaidan three years ago, and which the president declared a priority, has gradually evaporated from Ukraine’s media. Ukraine’s new law on transparency of media ownership merely confirmed what everyone had known for a long time anyway. The obligatory broadcast of analogue channels by cable operators is set to end this year, but even this has played into the hands of the media groups. Now they can demand money for this service. Of course, the oligarch’s channels still come into conflict with the authorities. For instance, last year interior minister Arsen Avakov tried to head up the battle against Dmitry Firtash’s Inter TV. (Avakov has his own score to settle with Firtash in Ukraine’s gas sector.) Avakov and members of his National Front party (which has quite a few people from the media in it) launched an aggressive campaign against the channel. Inter was accused of playing to the agenda of Opposition Bloc, a coalition of old Yanukovych-era forces, cooperating with Kremlin propagandists and separatist authorities, and broadcasting insufficiently patriotic programmes and films. 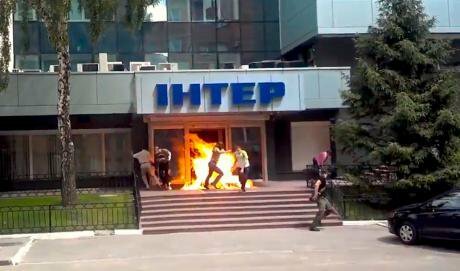 Arson at the Inter TV offices in Kyiv, September 2016. Image still: Glavnoe.ua / YouTube. Some rights reserved.Having exhausted all legal methods — appeals to the media regulator, letters to the security services — the minister resorted to a more radical approach. During a protest in September 2016, organised by veterans of volunteer battalions close to Avakov, an office of a news production company that works for Inter was set on fire. The investigation, which is being conducted by the Avakov-controlled police, still hasn’t identified the culprits. In any case, Inter TV continues to operate as if nothing has happened, but it never misses a chance to accuse Avakov of every mortal sin. At the end of 2016, Igor Kolomoisky’s TV channel 1+1 started a conflict with the state. After the nationalisation of Kolomoisky’s Privatbank, the largest bank in the country, 1+1 accused the National Bank of incorrect policy and the “seizure” of a successful business. A few days later, 1+1 stated that there had been an attempt to recall its broadcast license, although after a few stressful days, it nevertheless received renewed permission. As we can see, Ukraine’s oligarch-owned TV channels always keep within certain boundaries in their confrontation with the authorities. The result is that they maintain their place in the airwaves. Inter TV never misses a chance to accuse Avakov of all mortal sins, and 1+1 - the chance to criticise the head of the National Bank. The Ukraina channel praises its owner Rinat Akhmetov on a daily basis for his humanitarian aid to people in the Donbas. Viktor Pinchuk’s ICTV doesn’t forget to stress the role of its owner’s father-in-law Leonid Kuchma in the Minsk negotiations. And all of them modestly are silent about Petro Poroshenko. In September 2016, Vox Ukraine conducted a content analysis of these four channels’ Sunday newscasts over the past two years. They came to a startling conclusion — of the many of mentions of Poroshenko in the news, only one to two percent of them were critical of Ukraine’s head of state. Yanukovych couldn’t even dream of this kind of approval. The situation with Alexander Onishchenko’s kompromat, or “compromising material”, has once again drawn attention to this situation. Experts from MediaSapiens, which monitors compliance with journalistic standards in Ukraine’s news, note that in broadcasts throughout December 2016, leading television channels attempted to pass over the scandal. Instead, correspondents focused on the crimes Onishchenko is accused of, and his attempts to sow discord in Ukrainian politics. But almost nobody dared to broadcast the accusations levelled against Poroshenko. Why don’t the big television channels criticise the president? It’s hardly a matter of the owners’ and journalists’ patriotism. In Ukrainian society, with its entrenched oligarchy, loyalty in the information sphere continues to be a guarantee of keeping your business and political influence — everything that the Family lost back in 2014. Despite these disquieting stories on the failings of oligarch-controlled media, it’s clear that independent journalism in Ukraine has experienced a recovery since 2014. By fleeing their gilded cages, some Ukrainian journalists are benefitting from the experience of international colleagues and foreign grants, joining forces to work on new projects. However, these new projects are mostly limited to the internet, which does not give them access to anything like the same audience as television channels. Great hopes were put into the launch of Public Television, a state TV channel with large terrestrial coverage. The establishment of an independent public broadcaster was the one of the first tasks set by the media community for Ukraine’s new authorities. The reform of the country’s archaic and cumbersome public broadcaster, which had served as a mouthpiece for the authorities for years and had a complex regional structure, was launched in 2014. For two years, the new head of Channel One, Zurab Alasania, willingly broadcast anti-corruption investigations as well as documentary films by independent journalists, and patiently heard the complaints of offended politicians on the side. This autumn, Alasania resigned from his post, complaining of wide resistance to reforms. The recently adopted state budget for 2017 has confirmed his suspicions: the funding allocated to the channel isn’t enough for fully-fledged broadcasting. Journalists believe that the publication of their personal details on the Myrotvorets website is a violation of their constitutional rights. 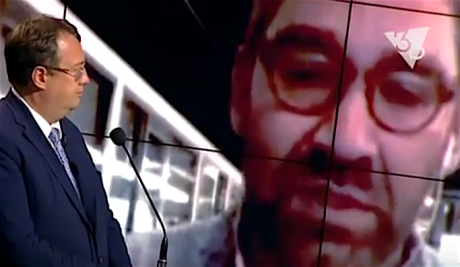 Here, Simon Ostrovsky takes part in a heated debate with Rada deputy Gerashchenko, on the Shuster.Live programme. Image still: Oleg Petrichenko / YouTube. Some rights reserved.Trying to find their way to their audience through social networks, independent journalists have come up against a counterproductive, even hysterical, consumption of information. The revolution and war in the Donbas have conditioned people to seek out simple answers, — they have less patience to listen to opposing points of view. Today’s real opinion-makers are “patriotic” activists and politicians, the commanders of auxiliary battalions and volunteers. The stories they peddle are not only far from objective analysis — they’re far from the truth, too. The incessant back-and-forth between zrada (treachery) and peremoha (victory) as people try to make sense of the news has infected many in mainstream media. Quick to follow the “opinion-makers” were the “opinion-hawkers” — bloggers who put out easily-accessible, half-baked messages for a tidy profit. Fittingly, a new word appeared in the lexicon of Ukrainian journalists this year, “Porokhobot” (a portmanteau of “Poroshenko” and “robot”). Attacks by Porokhobots, floods of aggressive online comments from little-known users, first appeared after the Panama Papers in April 2016, when investigations began into the offshore holdings of Ukraine’s head of state. It’s difficult to establish conclusively how these attacks are carried out, but their goal is obvious — to distract attention from the subject at hand, destroy trust in journalism and simply trolling. Unfortunately, these objectives coincide with the interests of many those in power. In May 2016, the website Myrotvorets, which is linked to Arsen Avakov’s advisor Anton Herashchenko, published the personal details of journalists accredited in the so-called “Donetsk People’s Republic”. The list, including some 4,000 names, contact details and passport numbers of Ukrainian and international correspondents by hacking the emails of separatist officials. The list was accompanied by a commentary by Myrotvorets’ staff, who accused the journalists featured of collaborating with terrorists and demanded that they be deprived of the right to work in Ukraine. Almost immediately, Herashchenko, members of Avakov’s staff — and eventually the minister himself — voiced their support. Social networks joined in, with users accusing the journalists of treason and making open, and not so open, threats against them. Nevertheless, many Ukrainian politicians, western embassies and international organisations leapt to the journalists’ defence. The president called the event a mistake, though he denied all ties between Myrotvorets and the authorities. Investigations by the police, which operates under the remit of the interior ministry, into the publication of personal details and threats against journalists have so far been fruitless. Myrotvorets continues to publish new lists of journalists, threatening their ability to perform their professional duties. Ukraine’s coalition government received an unprecedented level of trust at the 2014 elections, and this gave Poroshenko and his team confidence that they had chosen the right policies. This confidence, however, has gradually turned into an inability to accept any criticism — whether it’s about the lack of progress towards a visa-free regime with the EU, a peaceful resolution to the conflict in the Donbas, Poroshenko’s unfulfilled promises to sell his interests in the Roshen confectionary concern or the rise in utilities tariffs. There are enough real reasons. The president’s entourage, chief among them the coalition partners from the “war party” led by Arsen Avakov, seem to have only nurtured this confidence, transforming it into paranoia. For the authorities, any criticism comes from enemies of Ukraine — from the Kremlin and its agents, hell-bent on destabilising the country. Of course, these fears aren’t groundless. These are turbulent and volatile times for Ukraine. But “destabilisation” is gradually becoming a trump card against which there cannot be any counter-arguments. And journalism is becoming destabilisation’s most popular target. 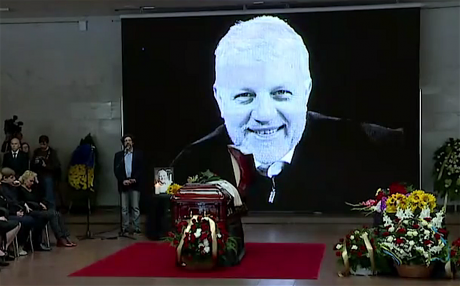 Kyiv says farewell to Pavel Sheremet. The famous journalist was assassinated in a car bomb last June. Image still: Radio Svoboda / YouTube. Some rights reserved.Have you worked on a story about corruption in Ukraine’s interior ministry? Perhaps shown dead soldiers on the front line? You’re destabilising the country. Are you investigating allegations of secret prisons run by the security services? You’re destabilising the country. You covered students protesting the cancellation of their scholarships? You’re playing into the hands of those who are destabilising the country. On the morning of 20 July 2016, the celebrated journalist Pavel Sheremet was assassinated in a car bombing in Kyiv. A couple of hours later, Arsen Avakov called the murder an attempt to destabilise Ukraine. Five months on, the investigation conducted by the Avakov-controlled police is yet to yield results.